By Gilbert Aman – Tuesday April 2, 2019. Students of Government Bilingual High School Deido cried when their friend was stabbed. At least three nurses of the Deido District Hospital, a health facility in Cameroon’s economic capital, Douala, where a 17-year-old secondary school student, Blérios Tsanou died have been suspended, a statement from the country’s Public Health Ministry said. Cameroon’s Public Health Minister, Dr Manaouda Malachie in a decision read Tuesday April 2, 2019, on state radio, CRTV, indicated; Ndonda épse Mbella fidèle Marie – Ntogni Célérie épse Kouamo and Nlontchi Ndeko Célestine all three said to be nurses of the above named infirmary have been suspended for three months each, citing unprofessional medical conducts. 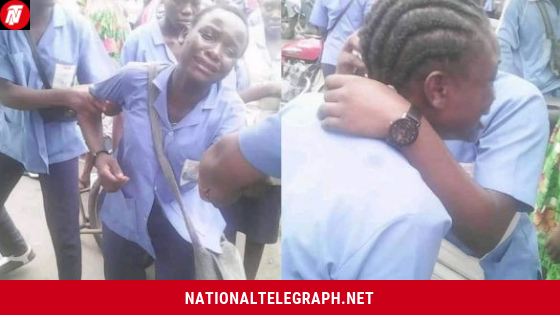 Blérios Tsanou, a student of Government Bilingual High School (GBHS) Deido died at the emergency unit of the hospital, Friday March 29 2019, after being stabbed by his former school mate on the campus of Government Bilingual High School Deido, Douala I Sub-division, Wouri Division of the country’s Littoral Region. He was rushed to the hospital few minutes later but died under circumstances qualified by many as negligence on the part of hospital staff. The Minister in an earlier reaction condemned the behavior of some of the workers who were caught on camera, taking pictures of the bleeding student instead of trying to help. The Minister’s three-month suspension decision accuses them of lack of professional ethics. Shortly after the death of Blérios Tsanou, Cameroonians demanded the firing of authorities of the Deido District Hospital and Government Bilingual High School Deido for lack of professionalism . Many could not understand how the murderer, a recalcitrant student succeeded in getting into the school campus with a knife. He was expelled from school for indiscipline but kept coming, National Telegraph has been told. The Director of Deido District Hospital convened a crisis meeting at the hospital, Monday April 1, 2019 with focus on identifying professional failures among staff that lead to the death of Blérios Tsanou. A similar meeting held at Government Bilingual High School Deido out of which staff demanded for security enforcement on campus. Previous Cameroon Authorities Raise Concerns Over Second Administrative Unit Lost To Ambazonia. Next CNN, UN Attacked By Amazon Bestselling US Priest For Covering Biya Regime.